right off the tram stop(good for sightseeing). 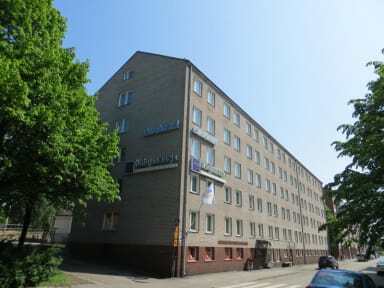 You can choose to walk and all major Helsinki attractions are within walking distance. The staff is extremely polite and helpful. They directed us with travelling trips, souvenir shopping, ensured we were cozy and made it a great experience overall. The sauna experience is another plus for this hostel. Kitches and lounges are great. Supermarkets and restaurants are a bit far but you can always stop there on the way to the hostel. Recommend it! The hostel was within 20 minutes walking distance from the city center, but there were many things to do at the very close area, restaurants, bars, public sauna etc. The room that i stayed was simple and clean. There is also a sauna inside the hostel that you can use which is for free from 7 till 10 am. The staff was really friendly and helpful. Value for money compare the prices to other hostels. I would gladly stay there again. Recommended! Super location, only about 10 minutes walk into the city centre. Rooms were ideal, clean and spacious. Bathroom facilities were also clean. Although as were there in January the hostel was quiet, but with only 3 showers and 2 toilets on our floor I would be a little concerned how long you might have to wait during peak season. But overall excellent value for money and good location which was all we needed as part of our city break. More like a budget hotel rather than a hostel. 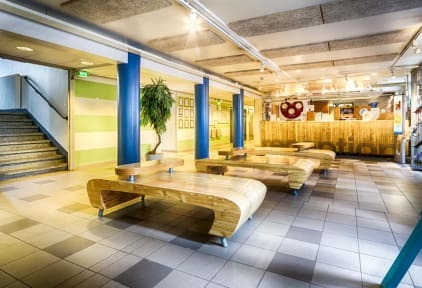 This has the feel of a budget hotel more than a hostel. If you are looking to meet new people I would not recommended it. However it is very clean, includes a free sauna in the morning and also an all you can eat breakfast buffet for €10 which is good value if you eat a lot. The kitchens are fairly well equipped with big fridges. The staff are not particularly friendly or helpful. The location is great. It is a short walk from the ferry terminal to Tallinn. It is about 10-15 mins to centre. Extremely uncomfortable beds, and curtains that don't stop the sunlight in the morning so as soon as the sun rises you're up. Bathrooms are clean though. The woman from the hostel who I spoke to on the phone when I arrived in Helsinki was friendly and helpful. The woman who checked me in wasn’t so friendly and informed me people from Finland “don’t do small talk.” That didn’t seem to stop her “doing small talk” with her colleague whilst I was filling out my long winded registration form and also at breakfast the following morning when small talk seemed to be her specialist subject. The hostel is basic, but in a great location.